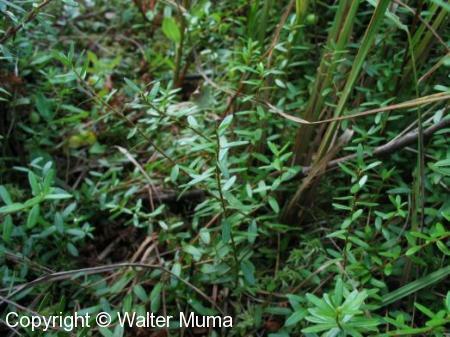 Distinctive features: Sub-Shrub; Tiny plants, with delicate stems and leaves, but huge berries, relative to their size. This species produces flowers and berries on stalks branching from the stems below the end. They are either solitary or in small clusters.  Highbush Cranberry (Viburnum trilobum) - similar only in name. Height: Up to 15 cm (6 in); A very small, low-growing sub-shrub. Edible: Berries are edible. Best if cooked. Notes: Cranberries are actually tiny shrubs, although most people probably wouldn't think of them as such. They grow in bogs. 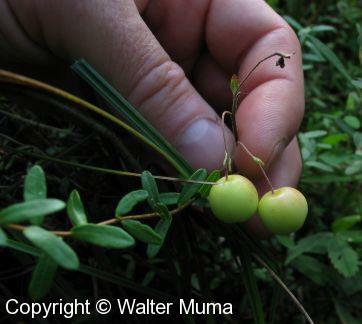 The main way to tell Large Cranberry and Small Cranberry (Vaccinium oxycoccos) apart is by the size of the berries. This species is the one that is grown commercially. Photographs: 119 photographs available, of which 3 are featured on this page. SCROLL DOWN FOR PHOTOGRAPHS. Ripening berries. 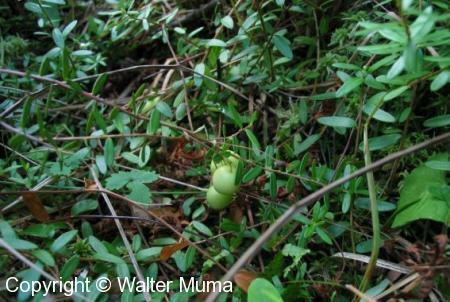 It can be seen, with comparison to the photos above, that the leaves are a bit larger than those of Small Cranberry (Vaccinium oxycoccos). The berries are an enormous size relative to the size of the leaves and the plant itself!